What’s underfloor heating and how does it work? Underfloor heating adds radiant warmth to any home. Not only does it feel wonderful underfoot, it also distributes the heat evenly. Unlike heating with conventional radiators, you won’t end up with cold spots in the house. Underfloor heating is not a new concept. We know it was widely used in Roman times, but there is also evidence of underfloor heating systems going as far back as 2,000 BCE in what we now call Pakistan, and a similar system was used in Korean houses in 1,000 BCE. 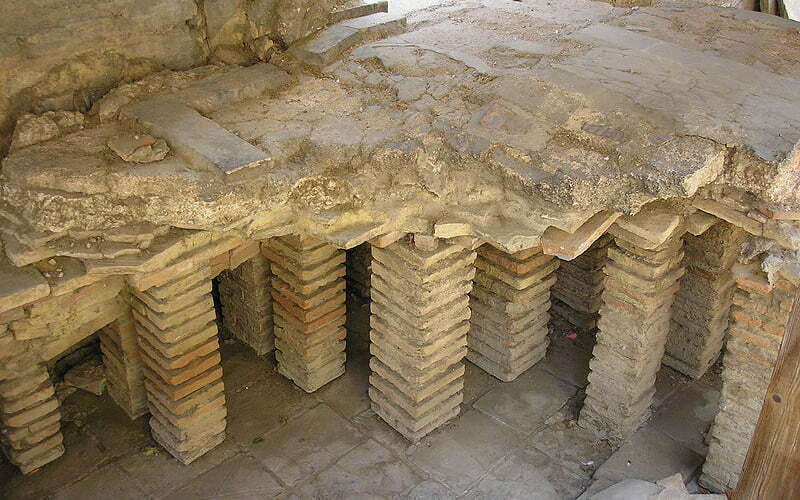 The Romans typically used this system (known as a hypocaust) in public baths and private villas. Essentially, it involved raising the floor on pillars, and then allowing air warmed by an open fire to circulate in the void under the floor. The closer the room to the fire, the warmer it was. The beauty of underfloor heating is that the heat is evenly distributed throughout your home, thanks to the even placement of the pipes under your floor, and can easily be comfort controlled using thermostats. Heat coming from a radiator heats the air directly over the radiator – this ends up being quickly dispersed and away from the desired area. Your warm air sits vertically in the room, but stays cold at floor level. With underfloor heating, the heat is coming directly from your floor – because warm air rises, this means it is evenly dispersed throughout the entire room. Another huge advantage of underfloor heating is its energy efficient properties. Radiators need much hotter water to feel the effects of the heat, therefore working your boiler harder. Due to the even distribution of the underfloor heating pipes, they work much more efficiently and can work with much cooler water. Aesthetically speaking, underfloor heating is a more elegant solution. There are no walls taken up with unsightly radiators, instead you are left with a completely open plan room and all walls are free for you to do as you please. There are two types of underfloor heating: water-based and electric. An electric underfloor heating system is suitable for smaller areas (such as a bathroom) and works independently from your regular central heating system. An electric underfloor heating system consists of electric heating wires that can be installed easily enough just underneath your floor. It is usually controlled by a timer. The water-based underfloor heating system needs to be installed when laying a new floor and is therefore generally used in new constructions, or when building an extension. You need a fairly robust boiler to run underfloor heating, so this should be discussed with your plumber to see whether the existing boiler can cope with the added capacity. 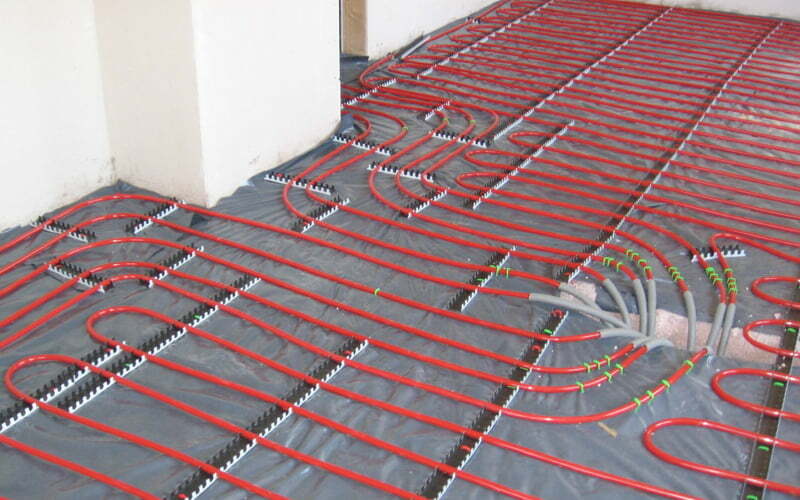 Underfloor heating pipes work by running heated water through them. The pipes are evenly laid in loops around the entire room, which gives you that beautifully even heat. As previously mentioned, underfloor central heating pipes only need to be brought up to a temperature of 40°C to 45°C – which is much more efficient than the 70°C to 80°C degrees required to feel the effects of heat from radiators. The pipes are laid on the sub-floor and clipped onto insulation boards. It’s a good idea to employ an experienced plumber to install your underfloor heating system. Once the pipes are laid, it’s important not to walk on them and to clear away all tools. All testing of pipes should be carried out at this stage. Once the pipes are installed and tested, they should quickly be covered by the screed or dry mix – this is to avoid the risk of damaging the pipes and also because if temperatures drop suddenly it will prevent the water in the pipes from freezing. A concrete screed laid over the pipes should be a minimum thickness of 75 mm. This is also the minimum thickness required where you are planning to grind your screed if you are opting for a polished concrete floor. 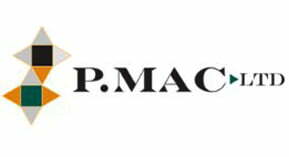 Ideally, you should use at least 50 mm of polyurethane insulation for the underfloor heating system. This is very high quality insulation and can be used for both concrete and timber suspended floor constructions. Insulation should be laid underneath the sub-floor to ensure heat does not escape into the ground, although in some cases it is laid on top of the sub-floor. If laying a concrete screed, it should be allowed to fully dry out before turning on your underfloor heating system for the first time. The company laying the screed will advise you on the best wait period – if you are planning to have your concrete polished, let them know. It is also vital that the temperature is brought up very gradually. Your new underfloor heating system when first turned on should be set to the minimum setting and the temperature increased by 2°c per day, up to a maximum of 50°c for concrete floors. This will help prevent the concrete from cracking. Underfloor central heating is at its best beneath a solid or polished concrete floor, where the latent heat builds up and is slowly released by the thermal mass. Concrete is an excellent conductor of heat and retains heat really well. This is why underfloor heating works so well for polished concrete floors. It is essentially like having a giant radiator under your feet. Underfloor heating does have a slower response rate than water-filled radiators. When initially switched on, it can take several hours to feel the benefits, although the exact time depends on several factors such as the thickness of your slab. However, you can divide your house up into zones, according to whether you like them warmer or cooler, and heat them accordingly – with thermostats in place to trigger the system. 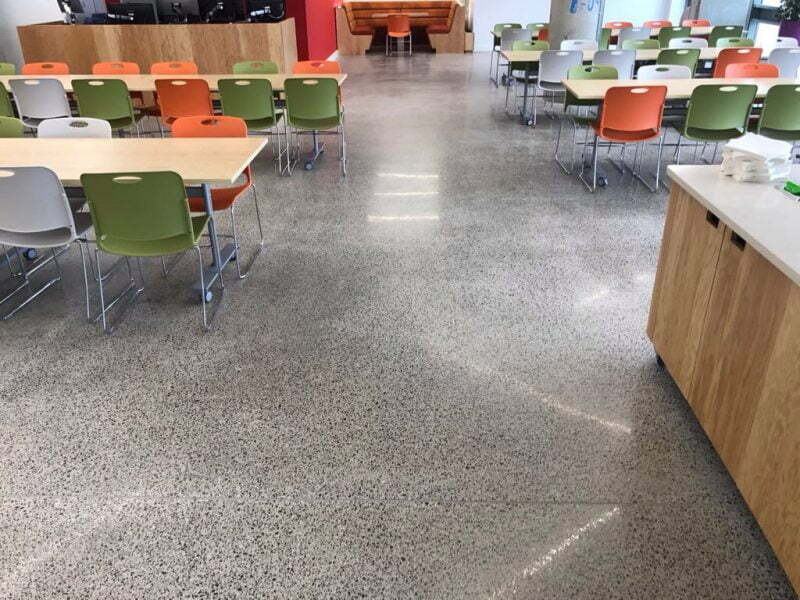 Although it takes a little longer for the warmth to take effect, concrete’s thermal store means that your floor will continue to radiate heat after the system switches itself off. Of course, the disadvantage of this solution is that you cannot heat up your house in a hurry if a sudden cold snap arrives. And on the flip side, if temperatures suddenly rise, it can take a while to bring down the temperature of your home unless you opt for opening all the windows! 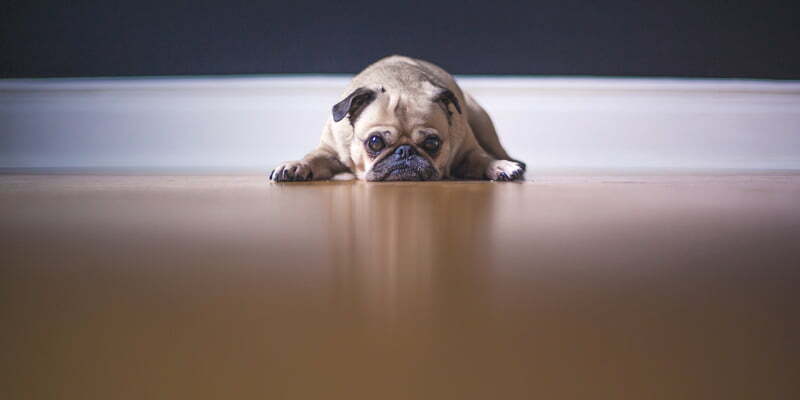 We believe, however, that the advantages of underfloor heating far outweigh any disadvantages, and that it is the perfect solution for heating a modern, energy-efficient home.